Our 6 week yoga course is open to anyone who has never tried yoga before or those wishing to get back to basics. We will introduce you to the basic principles and techniques of yoga as well as learning a basic group of warm-ups, postures, breath awareness and deep relaxation. You will be taught safe alignment and proper breathing in each pose so that you can experience the benefits of yoga from the very first class.Our beginners yoga academy has been running since we launched in 2013. 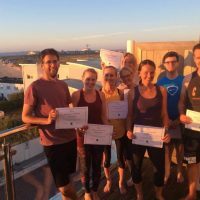 We have literally taught hundreds of complete new comers to the world of yoga and let us assure you…you are NOT to stiff to do yoga!The beginners yoga courses cover all aspects of yoga and once completed you will be able to choose the classes at Oceanflow Yoga Studio which best suit your goals and ambitions for doing yoga. We offer yoga classes to calm an anxious mind, classes to energise the body, classes that focus on alignment, classes to strengthen the core and stretch the body and so on!